...after the recent feast after the celebration of which the mission was first publicly announced. O Bestower of light, glory be to Thee! and proclaim to the world that Thou art in truth the Effulgence of the Father. Last night we served the first of our many upcoming services at the chapel at St. Andrews Church, Peoria, IL. The Moleben with the Canon for the Dormition went well. Lexi's singing was excellent. We were attended by Fr. Shawn, rector of St. Andrews and the dean of the ACNA Diocese of Quincy. Fr. Shawn has committed to letting us use the chapel for all of our services scheduled to date. 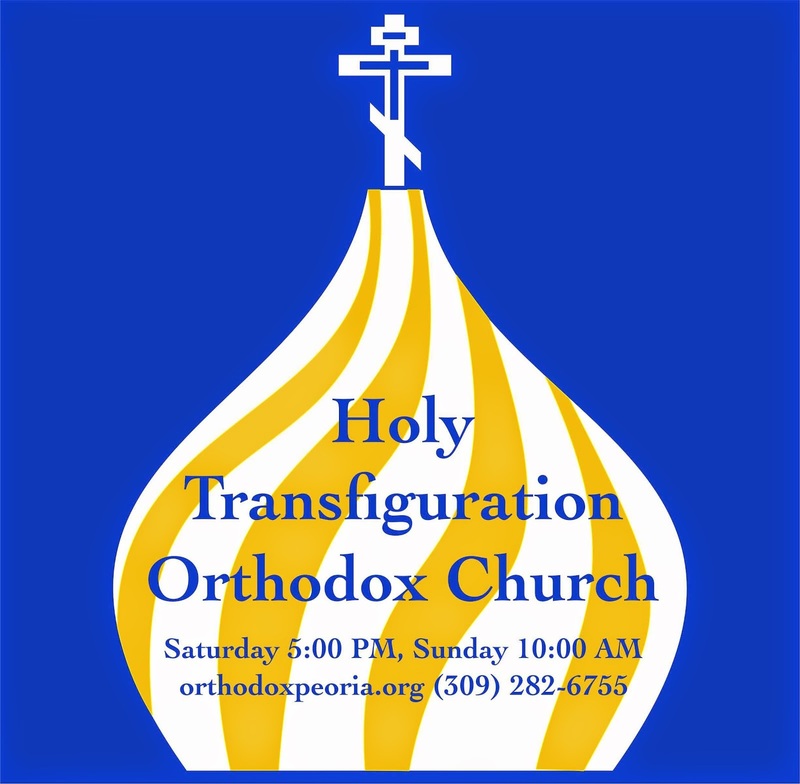 This schedule is posted here on our blog, http://orthodoxpeoria.blogspot.com, at the bottom of the page. In 2009 hundreds of thousands of people participated in a procession of the Kursk Root icon of the Mother of God in the city of Kursk (Russia). This was the first visit of the wonderworking icon to Russia since it was taken from the country after the 1917 Bolshevik Revolution. The "Falling-Asleep" or "Repose" ("Dormition", "Uspenie", "Koimesis") of our MostHoly Lady Mother of God and Ever-Virgin Mary: After the Ascension of the Lord, the Mother of God remained in the care of the Apostle John the Theologian, and during his journeyings She lived at the home of his parents, near Mount Eleon (the Mount of Olives, or Mount Olivet). She was a source of consolation and edification for both the Apostles and for all the believers. Conversing with them, She told them about miraculous happenings: the Annuniciation (Blagoveschenie), the Conception (Zachatie) without seed and without defilement of Christ born of Her, about His early childhood, and about all His earthly life. And just like the Apostles, She helped plant and strengthen the Christian Church by Her presence, Her discourse and Her prayers. The reverence of the Apostles for the MostHoly Virgin was extraordinary. After the receiving of the Holy Spirit on the remarkable day of Pentecost, the Apostles remained basically at Jerusalem for about 10 years attending to the salvation of the Jews, and wanting moreover to see the Mother of God and hear Her holy discourse. Many of the newly-enlightened in the faith even came from faraway lands to Jerusalem, to see and to hear the All-Pure Mother of God. During the time of the persecution, initiated by king Herod against the young Church of Christ (Acts 12: 1-3), the MostHoly Virgin together with the Apostle John the Theologian withdrew in the year 43 to Ephesus. The preaching of the Gospel there had fallen by lot to the Apostle John the Theologian. The Mother of God was likewise on Cyprus with Saint Lazarus the Four-Days-Entombed, where he was bishop. She was also on Holy Mount Athos, about which, as says Saint Stephen Svyatogorets (i.e. Saint Stephen of the "Holy Mount"), the Mother of God prophetically spoke: "This place shalt be allotted Me, given unto Me by My Son and My God. I wilt be the Patroness for this place and Intercessor to God for it". The respect of ancient Christians for the Mother of God was so great, that they preserved what they could about Her life, what they could take note of concerning Her sayings and deeds, and they even passed down to us the regards of Her outward appearance. According to tradition, based on the words of the PriestMartyrs Dionysios the Areopagite (+ 3 October 96), Ignatios the God-Bearer (+ 20 December 107), – Sainted Ambrose of Mediolanum-Milan (Comm. 7 December) had occasion to write in his work "On Virgins" concerning the Mother of God: "She was the Virgin not only of body, but also of soul, humble of heart, circumspect in word, wise in mind, not overly given to speaking, a lover of reading and of work, and prudent in speech. Her rule of life was – offend no one, intend well for everyone, respect the aged, be not envious of others, avoid bragging, be healthy of mind, and love virtue. When did She ever in the least hurl an insult in the face of Her parents, when was She at discord with Her kin? When did She ever puff up haughtily before a modest person, or laugh at the weak, or shun the destitute? With Her there was nothing of glaring eyes, nothing of unseemly words, nor of improper conduct: She was modest of body-movement, Her step was quiet, and Her voice straightforward; – such that Her bodily visage was an expression of soul, and personification of purity. All Her days She was concerned with fasting: She slept only when necessary, and even then, when Her body was at rest, She was still alert in spirit, repeating in Her dreams what She had read, or the pondered implementation of proposed intentions, or those planned yet anew. She was out of Her house only for church, and then only in the company of kin. Otherwise, She but little appeared outside Her house in the company of others, and She was Her own best overseer; others could protect Her only in body, but She Herself guarded Her character". [trans. note: In context, we must realise that Saint Ambrose wrote this discourse in exhortation to young women to conduct themselves maturely and with concern for the reputation of their good-name, an exhortation equally incumbent upon young men]. According to tradition, that from the compiler of Church history Nicephoros Kallistos (XIV Century), the Mother of God "was of average stature, or as others suggest, slightly more than average; Her hair golden in appearance; Her eyes bright with pupils like shiny olives; Her eyebrows strong in character and moderately dark, Her nose pronounced and Her mouth vibrant bespeaking sweet speech; Her face was neither round nor angular, but somewhat oblong; the palm of Her Hands and fingers were longish... In conversation with others She preserved decorum, neither becoming silly nor agitated, and indeed especially never angry; without artifice, and direct, She was not overly concerned about Herself, and far from any pampering of Herself, She was distinctly full of humility. Regarding the clothing which She wore, She was satisfied to have natural colours, which even now is evidenced by Her holy head-covering. Suffice it to say, an especial grace attended all Her actions". (Nicephoros Kallistos borrowed his description from Sainted Epiphanios of Cyprus, + 12 May 403, from the "Letter to Theophilos concerning icons". The circumstances of the Falling-Asleep or Dormition of the Mother of God were known in the Orthodox Church from times apostolic. Already in the I Century, the PriestMartyr Dionysios the Areopagite wrote about Her "Falling-Asleep". In the II Century, the account about the bodily Assumption of the MostHoly Virgin Mary to Heaven is found in the works of Meliton, Bishop of Sardis. In the IV Century, Saint Epiphanios of Cyprus refers to the tradition about the "Falling-Asleep" of the Mother of God. In the V Century Sainted Juvenal, Patriarch of Jerusalem, told the holy Byzantine empress Pulcheria: "Although in Holy Scripture there be no account about the circumstances of Her end, we know about them otherwise from the most ancient and credible tradition". This tradition in detail was gathered and expounded in the Church history of Nicephoros Kallistos during the XIV Century. At the time of Her blessed "Falling-Asleep", the MostHoly Virgin Mary was again at Jerusalem. Her fame as the Mother of God had already spread throughout the land and had aroused against Her many of the envious and the spiteful, who wanted to make attempts on Her life; but God preserved Her from enemies. Day and night She spent at prayer. The MostHoly Mother of God went often to the Holy Sepulchre of the Lord, and here She offered up incense and the bending of knees. More than once enemies of the Saviour sought to hinder Her from visiting her holy place, and they besought of the high-priest a guard to watch over the Grave of the Lord. But the Holy Virgin Mary, unseen by anyone, continued to pray in front of them. In one suchlike visit to Golgotha, the Archangel Gabriel appeared before Her and announced Her approaching transfer from this life into the Heavenly life of eternal beatitude. In pledge of this, the Archangel entrusted Her a palm branch. With these Heavenly tidings the Mother of God returned to Bethlehem with the three girls attending Her (Sepphora, Evigea and Zoila). She thereupon summoned Righteous Joseph of Aramathea and other disciples of the Lord, and told them of Her impending Repose (Uspenie). The MostHoly Virgin prayed also, that the Lord would have the Apostle John come to Her. And the Holy Spirit transported him from Ephesus, setting him alongside that very place, where lay the Mother of God. After the prayer, the MostHoly Virgin offered up incense, and John heard a voice from Heaven, closing Her prayer with the word "Amen". The Mother of God took notice, that this voice meant the speedy arrival of the Apostles and the Disciples and the holy Bodiless Powers. The Disciples, whose number then it was impossible to count, flocked together, – says Saint John Damascene, – like clouds and eagles, to hearken to the Mother of God. Seeing one another, the Disciples rejoiced, but in their confusion they asked each other, why had the Lord gathered them together in one place? Saint John the Theologian, greeting them with tears of joy, said that for the Mother of God had begun the time of repose unto the Lord. Going in to the Mother of God, they beheld Her augustly lying upon the cot, and filled with spiritual happiness. The Disciples gave greeting to Her, and then they told about their being miraculously transported from their places of preaching. The MostHoly Virgin Mary glorified God, in that He had hearkened to Her prayer and fulfilled Her heart's desire, and She began speaking about Her immanent end. During the time of this conversation the Apostle Paul likewise appeared in miraculous manner together with his disciples: Dionysios the Areopagite, wondrous Hierotheos, and Timothy and others from amongst the Seventy Disciples. The Holy Spirit had gathered them all together, so that they might be vouchsafed the blessing of the All-Pure Virgin Mary, and all the more fittingly to see to the burial of the Mother of the Lord. Each of them She called to Herself by name, She blessed them and extolled them in their faith and hardships in the preaching of the Gospel of Christ, and to each She wished eternal bliss and prayed with them for the peace and welfare of all the world. Dear brothers and sisters! Has the following ever happened to you? You are standing in church at a quiet evening service, when suddenly you feel from the bottom of your heart how dear this House of God is to you, how beautiful, noble, holy, mysterious and edifying everything in it is. Have you ever really felt the profound meaning and purpose of everything that happens at church services? Alas!, my dear friends, we often come to church, stand without any awareness of anything, without trying to enter into the meaning of the service, not even listening attentively to the reading and the singing. And all the time even the slightest detail can be very edifying. Here is a small church candle. People come, take one and light it in front of an icon and it burns. People have made a little gift to strengthen their faith. What does it mean, this small, quiet candle flame which rises up to heaven? First of all, a candle testifies to our love of God. People come to church and bring the present of their love. But does our soul burn like the fine flame of this little candle? Does the flame of our prayer rise up to heaven? Do we strive upwards with all our being, to the heavens, to holiness, to the beauty of a higher life which is dedicated to God?…But a candle does not only burn and shine, it also warms, giving off just a little warmth to those around it. What about us? Does our love warm those around us, those near and dear to us, those we live with and mix with? Or are we frozen in the ice of sin, of self-love, have we shut ourselves up and now lie there like a splint gone cold? Comparing human life to a candle, St Seraphim said that the wax in the candle is faith, the light is hope and the fire is love. If there is no love, then life is empty, pointless and fruitless. Just as a bad candle gives off soot, splutters and then goes out altogether, so sometimes our life gives off not the light of goodness, but the stench of sin and iniquity. So which is our life? Does it burn or does it give off soot, and perhaps go out altogether? 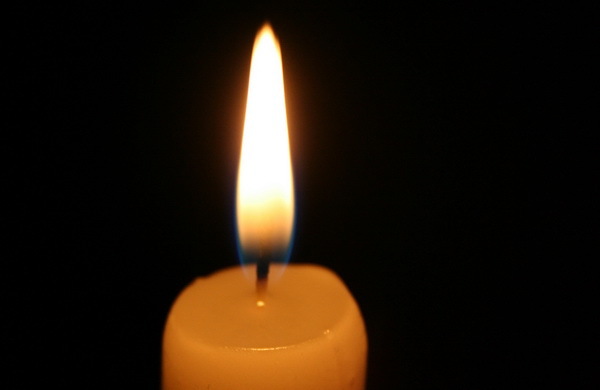 Dear brothers and sisters, this little candle also tells us whether we live our short earthly lives badly or well. If we burn ourselves out very quickly, then what will be left of us? Will there still be even a tiny glimmer of good as a result of our actions? Will there still be even a tiny glimmer of warmth and happy memories of us? A baby comes into the world crying. Holy Church gives him spiritual birth, washing him in Holy Baptism. A candle burns in the hands of the godparent, its tears of wax are like a living being crying before God for a new little person, his infirmity, his weakness and the many hardships he will face in life. But when a person grows up, he may stain his soul with sin in the storms of life. And then he comes to the holy sacrament of Repentance, lights a candle and puts it on the candlestand. This candle sheds burning tears for our sinfulness, our coldness and the darkness of our iniquitous life. When someone falls ill and turns to God, he receives unction, is anointed with holy oil, and next to him there burns a candle, as if raising his prayer up to heaven, interceding for him. When someone is on their death bed, then a candle is placed at the head of the bed as a symbol of their immortality, testifying to the fact that their soul goes on and burns before God in eternity…When family come to the grave, they too light a candle as a sign of their love for the departed and their memory of them. And so throughout life and even after death a candle burns with us, unnoticed and small. What faith we show when, in times of sorrow and difficulty, we light candles in front of the icons of the Saviour, the Mother of God or His saints, what consoling mercy our Heavenly Father shows our grieving souls, sending down His help to them. We light a candle and it seems to speak to us: I am burning and you, a soul that has gone out, light up, light up, do not fear life’s tempests, light up, even though the wind is making you waver, and burn, shine and warm. My dears, we can be especially happy that we are standing here and all praying together, that our little prayers and sighs merge into one general sigh, heading upwards, like a candle flame which reaches the heavens and the throne of God. The feeble light of our small, lonely prayer may not be strong enough to shine and warm, but the great flame of general prayer may blaze up and melt. Perhaps, unknown to us, there are people of prayer standing alongside us, those who are great spiritual people before the face of God. Together with their prayer, our feeble, cold prayer will also go up from earth to heaven, to the very throne of God. We should be all the happier that we are standing and praying in this holy place, warmed and hallowed by the feat of prayer of St Sergius, our great father in God. On this very spot there once stood a small wooden church, hallowed not by a candle, but by a simple splint. However, the hearts of the ascetics, those who gathered here, zealous for piety and salvation, attracted by the brightness of St Sergius’ virtues, shone brighter than any beacon. Dear brothers and sisters, just light your little wax candles more often. They burn with the fire of a great and firm faith, as if reminding us of the widow’s mite. Let us remember that Church life is our life. A candle is our love of God and our neighbour. A Church candle is the strength that helps us in the difficult moments of life and death. Amen. On August 18-19th, His Grace, Bishop Peter, celebrated the Feast of the Transfiguration of Our Lord at the Holy Virgin Protection Cathedral in Chicago. During the reading of the Hours, Vladika Peter tonsured Arsenios Corbishley a Reader. Arsenios had been studying in Chicago for the last few years and serving in the altar at the Cathedral. He returns home to Oklahoma City to continue serving now as a Reader at St. Benedict's Orthodox Church. Immediately following the tonsure, Reader Benjamin Bryant was elevated to the rank of Sub-Deacon. He will be helping to start a mission community in Peoria, IL. AXIOS to Reader Arsenios and Sub-Deacon Benjamin! At the hierarchical Divine Liturgy con-celebrating with Bishop Peter were the cathedral clergy and Fr. Matthias, pastor of the Georgian Orthodox community in Chicago. Following the Liturgy, the service of the blessing of the fruits took place on the steps of the cathedral under a beautiful sunny sky. Glory be to our great God and Savior, Jesus Christ! At the Cathedral of the Holy Protection of the Mother of God in Des Plaines, IL, on the glorious feast of the Transfiguration of our Lord God and Savior Jesus Christ (August 19th, 2012 on the civil calendar) it was announced by His Grace Bishop Peter, Pastoral Vicar of the Diocese of Chicago and Mid-America of the Russian Orthodox Church Outside of Russia (ROCOR) that efforts are underway to establish a mission of the Russian Orthodox Church in or near Peoria, IL. This new community will live as part of the Russian Orthodox Church Outside of Russia in communion with the Patriarch of Moscow and all other canonical Orthodox churches worldwide. We will worship according to the Russian Typikon and on the unaltered Church Calendar, but we will also hopefully be very much a light that shines openly *in* this American community and its history with prejudice only toward the fullness of the life that is in Jesus Christ alone. We are looking for friends who are mindful of history and who crave authenticity, and yet who also appreciate how modern society is ever more systematically and deceptively stacking the deck against such things. Feel free to reach out to us here, by commenting below. Also look us up on Facebook. Grant, O Lord, that Thy servants here in and around Peoria, IL will be illumined with the light of the Orthodox Faith, and numbered with Thy One, Holy, Catholic, and Apostolic Church. O Lord Jesus Christ, Son of God, have mercy on us and save us, for Thou art good and the Lover of mankind. Amen.